feels less like failing, and they can resume from where they've fallen from (getting more practice at the intermediate jumps) or just reload if they dropped a checkpoint closer. Kinda tangentially related but i get the thing with easy levels=boring levels. A lot of rhythm games kinda feel the same way where easy difficulties have so few notes that you can't really get in the groove of the song. When you start increasing difficulty the number of notes increases and you start actually playing along to the song! But also mechanical complexity usually increases too at the same time. I've had a few friends play rhythm games with me and find it difficult to find the sweet spot between "this isn't boring" and "there's far too much going on at once". Kinda like, wanting to hit every note of a tune without having to play guitar hero with all five buttons sorta thing. Stephen's sausage roll is a decent example of a game that does intro levels well imo. Rather than having simple boring 'you can't mess this up' levels to teach you mechanics, it just sets up a bunch of extremely tight, short puzzles at the start of the game that often feel impossible until you get a new insight into the mechanics, usually through experimentation. Compared to something like DROD which just loves to open with the dull non-puzzle of "swing your sword repeatedly to kill some roaches" or puzzles that veer more towards tedious than interesting. i was reading an interesting breakdown of super mario world about how mario games achieve "fun while not too hard" (although marios are kinda easy still), and it basically works because mario is actually not just a platformer, but it's a fusion platformer-action game. there are levels focused on technical jumping, etc. 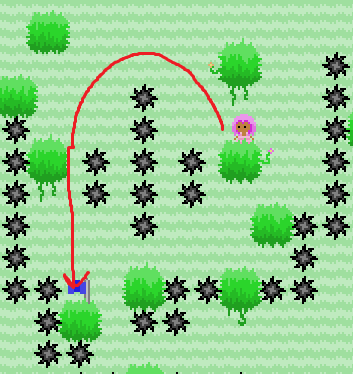 but there are also levels more "action"-focused that deal more with fighting / dodging enemies. a game with only one major mechanic cant do much other than linearly scale the difficulty, which is okay for arcade-type games, but in a long-form game, players either get fatigued, or adapt so it becomes monotonous. 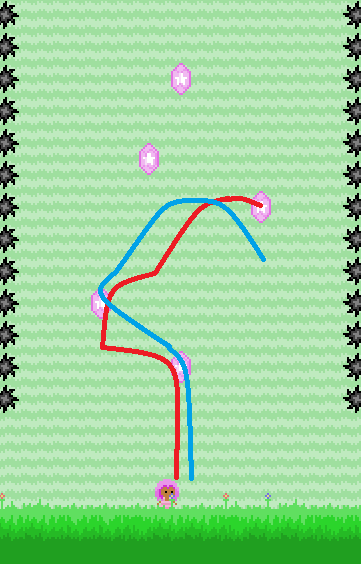 the idea with a fusion game is that the levels will constantly switch back and forth between focusing on the two different mechanics. this means that levels can be "challenging" even if they aren't technically becoming harder, because "switching gears" so to speak is difficult in and of itself. but the players will get greater senses of accomplishment / overcoming because when they do switch gears they'll be able to adapt to harder things a lot faster, because they technically already have most of those skills. basically you have two different difficulty curves which can go up and down and which interlock with each other which makes the game progression more interesting. 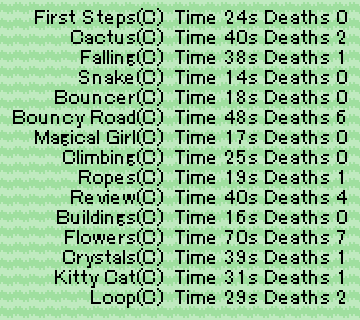 even in the context of a pure platformer, like jumper 2 has a good variety of different kinds of jumps (double jumpnig, wall-jumping, skid-jumping, etc). and there's enough variety where rarely do 2 levels in a sector feel overly similar to each other in terms of what they are testing out. meatboy has a lot of jumping hard stuff, but also a lot of avoidance / pathing hard stuff (moving blades, dodging rockets, etc). cuphead has shooting and jumping. guess i'll have to... make them fall. Good intro levels and cool gimmicks, though! Not sure if it leads straight into the other level groups, but it feels like a good start to an approachable difficulty curve. The shorthop is sort of hard to get used to, and it seemed pretty essential for Spikey Halls X. The fact that it basically has its own levels of jump makes it complicated to keep track of, so I just planned around doing "full height" shorthops. I feel like it'd be more useful to the player being non-variable as was suggested. If they're good at jumps they'd probably beat those levels really quickly. But I mean, I've seen people get stuck on the first level of Jumper 2 because they didn't understand skid jumping. Ya gotta teach them the mechanic, but it's probably not possible to make it accessible to everyone. also tbh the first couple of times i dealt with those red / yellow things from an untitlted they were super hard + unituitive.